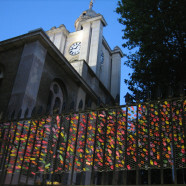 As the church clock chimes 7pm Rebecca Feiner will invite the audience to post a dream at East London’s answer to the Wailing Wall, “‘If dreams reflect the past, hope summons the future’ “, a colourful mosaic of visitors’ hopes, dreams and prayers collected over the duration of the exhibition. At 8pm a specially selected song will emanate from the sweeping staircase performed by Amorel Weston to accompany the piece ‘’ Incorporeal Consciousness’, followed by a short reading by John Gibbens. It’s also the last chance to see delicate works by Pauline Thomas, haunting projections in the belfry by Arabella Lee and May Ayres’ affecting sculptures. Join us for a very special last night!